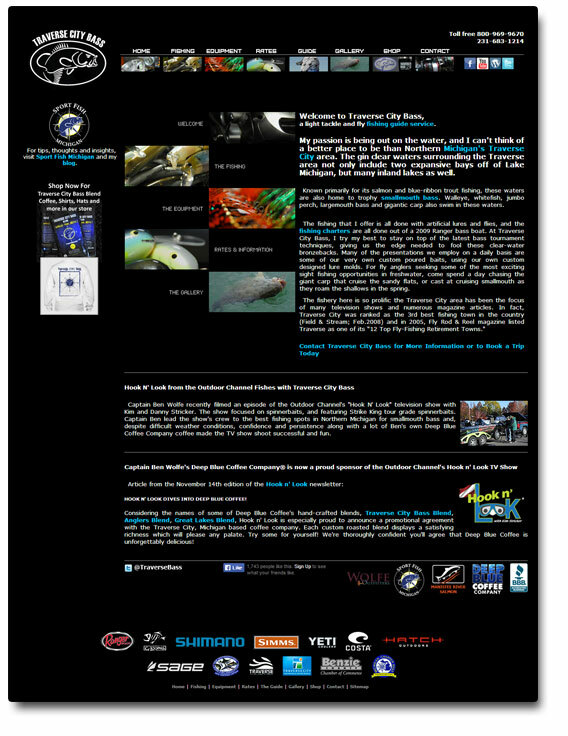 Traverse City Bass is based out of Traverse City, Michigan. The Traverse City area is known for its gin-clear waters and prolific fishery. Traverse City has been recognized as one of the nation’s best fishing locations by publications including Field & Stream and Fly Rod & Reel magazines. Traverse City Bass offers customers “the best of the best” in Michigan bass fishing. The company’s principal guide is Captain Ben Wolfe, known for his unwavering dedication to providing customers with the most enjoyable and memorable fishing experiences of their lives. Join him in his fully-rigged and MDNR inspected Ranger Z520, equipped with an Evinrude 250hp E-Tec, and loaded with state-of-the art equipment and G.Loomis Rods and Shimano reels for customer’s use. Utilizing the latest bass tournament fishing techniques combined with time-proven tactics and expert knowledge of Michigan’s bass fisheries, Traverse City Bass gives customers the edge that creates the area’s best bass fishing experience. Equally adept at fishing big water, such as the Grand Traverse Bays, and the area’s many inland lakes and streams, Captain Ben Wolfe provides customers with the best bass fishing opportunities Michigan has to offer. Traverse City Bass also offers a limited number of jigging trips for lake trout, for which the Traverse City and Frankfort areas are known. A hands-on approach, Captain Ben Wolfe guides customers for these scrappy fish on light tackle, providing customers with the opportunity to catch dinner! Many customers even enjoy a split day of bass fishing and lake trout jigging. Traverse City Bass and Captain Ben Wolfe are fully licensed and insured.